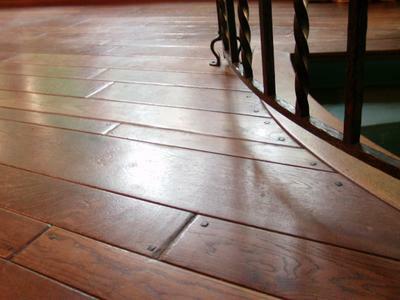 We had special old plank floors, widths up to one foot, hand scribed, with square pegs that were slightly raised. They were finished with Varnowax originally, then wood floor wax only. They were in rough shape, badly worn and splotched up with stains. Refinishing would be the obvious choice but the soft hand-made look would have been ruined. With Jerry's expertise we chose another option, cleaning with a product that 'melted' the old wax and stain. Then he used a colored wax and buffed. They are beautiful! We are going to sell the house and the work on the floors has improved the look and value of the home. Rather than being a negative, they have become a positive. I would be happy to refer Jerry to anyone who wants a good job done. I already have! 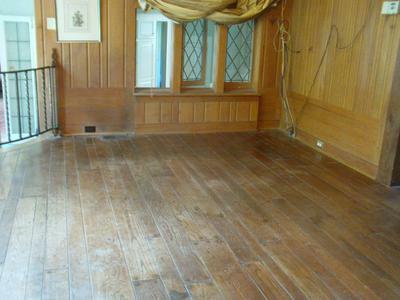 Thank you, Kathy, and I'm sure other owners with historic hardwood floors thank you, too. 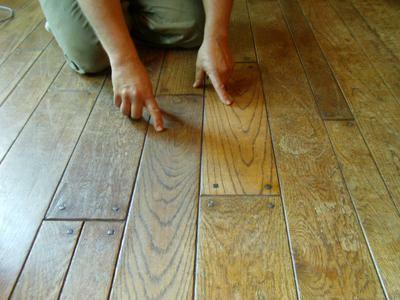 Most floor sanding machines aggressively find flat in the rough sanding, or first pass over the floor. For a floor like yours, that would be disastrous. For example, those lovely old square pegs were cut from end grain, so while the rest of your floor boards have worn down, the harder pegs stand proud. Also, beveled edges disappear in a typical sanding process, but never evenly. More of the bevel remains in flatter areas, while areas that may be cupped or crowned for whatever reason will lose most or all of their beveled edges. The results are unsightly. 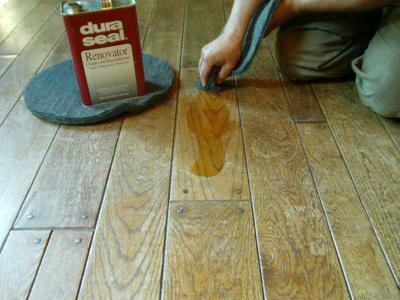 The DuraSeal Renovator product that you mentioned is not always a necessary step in the process. It is a very old-fashioned and potent solvent, petroleum-based, stinky, high VOC. Anybody considering this product must protect themselves, as well as other finished surfaces in the vicinity. It is nasty stuff, and just what your floor needed. I commend you for applying logic, really slowing down to consider your options, and choosing to apply the TLC your lovely old floor needed. May this floor's next owner share your appreciation for it.